Androgenetic alopecia is an extremely common disorder that affects roughly 50% of men and perhaps as many women above the age of 40 years. Reportedly, as many as 13% of premenopausal women experience androgenetic alopecia. However, the incidence of androgenetic alopecia increases greatly in women following menopause, and, according to a source, it may affect 75% of women older than 65 years. A community-based study of androgenetic alopecia in six Chinese cities indicated that the prevalence of androgenetic alopecia in both Chinese males and females was lower than that seen in Caucasians, but of comparable incidence to their Korean counterparts. The most common type of Alopecia Areata presents as round or oval patches of hair loss, most obvious on the scalp or in the eybrows. Those who develop round or oval areas of hair loss can progress to toatal scalp hair loss. (Alopecia Totalis). The cause of Alopecia Areata is unknown, but commonly thought to be an autoimmune disorder. The most common treatment is with steroids (cortisone is one form), either topically or by injection. Traction Alopecia is caused by chronic traction (pulling) on the hair follicle and is seen most commonly amongst African- American females associated with tight braiding or cornrow hair styles. In most cases, this form of alopecia manifests itself along the hairline. Men who attach hairpieces to their existing hair can also experience this type of permanent hair loss if the hairpiece is attached in the same location over a long period of time. Trichotillomania is a traction related form of alopecia. Trichotillomania is the name given to the habitual and compulsive plucking of hair from the scalp and/or other hair-bearing areas of the body. Long-term trichotillomania can result in permanent irrevocable damage. It remains unknown whether trichotillomania should be classified as a habit or as obsessive-compulsive behavior. In its mildest form, trichotillomania is a habitual plucking of hair while a person reads or watches television. In its more severe forms, trichotillomaniahas a ritualistic pattern and the hair-plucking may be conducted in front of a mirror. The person with trichotillomania often has guilt feelings about his or her “odd” behavior and will attempt to conceal it. Hair loss due to trichotillomaniais typically patchy, as compulsive hair pullers tend to concentrate the pulling in selected areas. Hair loss in this case cannot be treated effectively until the psychological or emotional reasons for trichotillomaniahave been addressed effectively. Hair loss due to scarring of the scalp is called scarring alopecia. Scarring can be due to a variety of causes. Traction alopecia over a period of time may lead to scarring and permanent hair loss. Similarly, trichotillomania(compulsive hair-plucking) can cause permanent scalp scarring over time. Injury to the scalp caused by physical trauma or burns may leave permanent scars and permanent hair loss. Diseases that may cause permanent hair loss due to scalp scarring include (1) the autoimmune conditions lupus erythematosusand scleroderma, and (2) bacterial infections such as folliculitis, fungal infections, and viral infections such as shingles (Herpes Zoster). A form of scarring alopecia also may occur in post-menopausal women, associated with inflammation of hair follicles and subsequent scarring. Triangular alopecia is loss of hair in the temporal areas that sometimes begins in childhood. Hair loss may be complete, or a few fine, thin diameter hairs may remain. 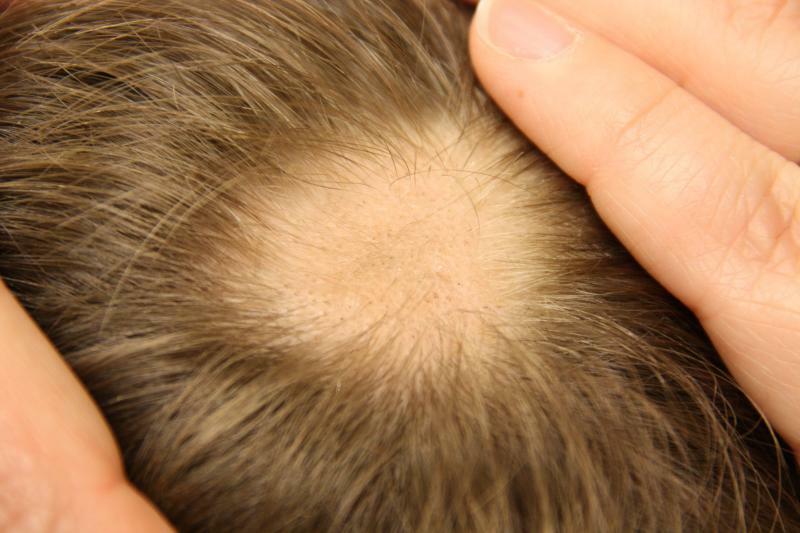 The cause of triangular alopecia is not known, but the condition can be treated medically or surgically. Telogen effluvium is a common type of hair loss caused when a large percentage of scalp hairs suddenly going into “shedding” phase. The causes of telogen effluvium may be hormonal, nutritional, drug-associated, or stress associated. Loose Anagen Syndrome typically affects fair-haired persons,and happens when scalp hairs sit loosely in their hair follicles so they can easily be extracted by combing or pulling. It appears in childhood but usually improves as the child ages.